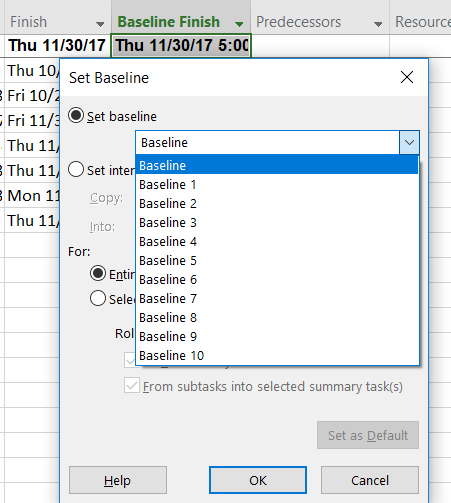 We recently ran across an interesting situation where a schedule has a baseline, but, in the Set Baseline pop up box, there is no indication of a baseline ever being saved. Is this a bug? I don’t think it is a bug as much as it is a logic issue that may need to be addressed at some point. Technically, in this case, it is true – there is a Baseline but no Baseline has been saved through the Set Baseline pop up for this specific and so it doesn’t show in that box, even though the data clearly shows. For these examples we are using Project Online but this also occurred in Project Server in house (2016) so this seems to be a universal Microsoft Project issue. Here is the explanation of how this came to be…..
We had a lot of schedules that were not previously baselined and needed to be and we wanted it done immediately. We didn’t have the patience to wait for every Project Manager to set a baseline and publish their schedules. We came upon a pretty good solution – we would open the schedules in a Master Project, set the Baselines for all of them and then not save the Master Project but save all of the projects individually. a. 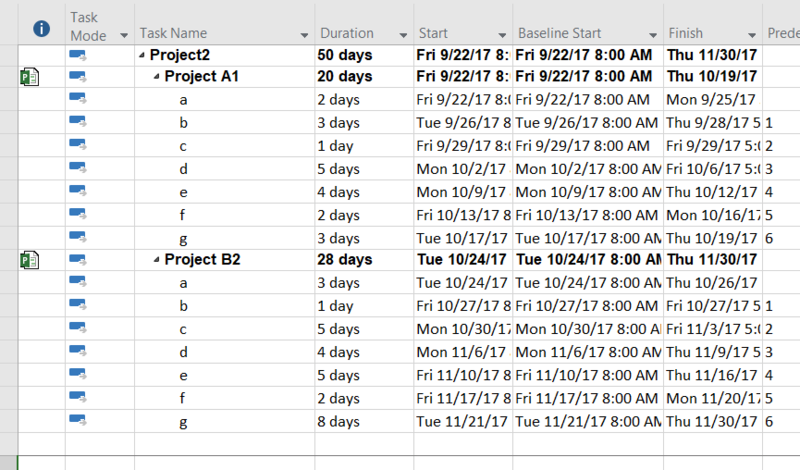 In this case, Project A1 and Project B2 were added to the Master Project called “Project2” 3. 3. 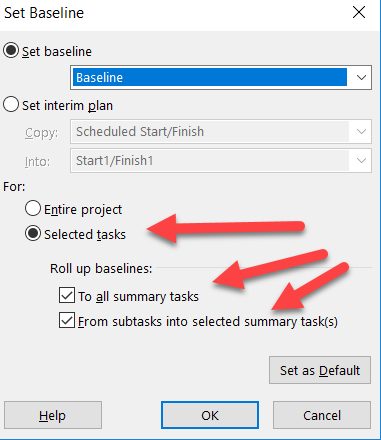 IMPORTANT NOTE – You must expand all tasks or the baseline will NOT be sent for the tasks (it will only set for the exposed tasks). 5. 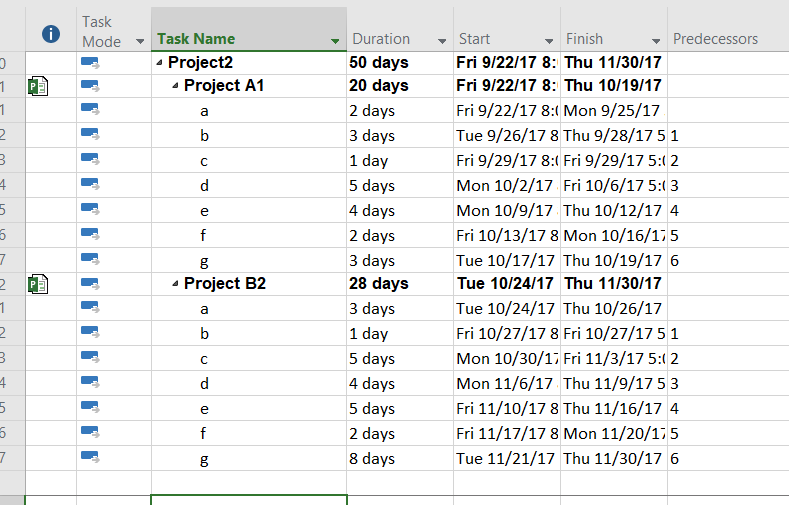 This is what my two project tasks look like expanded – but most real world schedules will have numerous summaries and subtasks. 8. Everything will become selected, as indicated by the gray in the image above. 9. 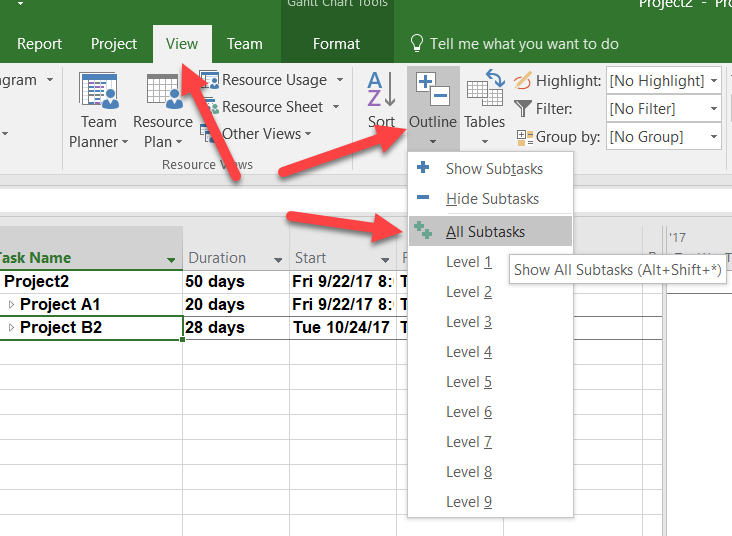 Go to Project, Set Baseline and Set Baseline from the pop up box for the Selected Tasks and select both the Roll up options. 10. See here for a White Paper on setting Baselines if you have questions about Baselines and what to do “normally”. 11. Once you select OK, then you should now see the Baseline fields completed for all sub projects and the Master Project. 12. The key step now is to Close the Master Project and NOT save it. 13. 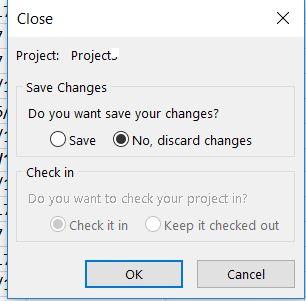 After selecting OK, the option to save each of the sub projects will appear. Just select yes to All. 14. That completes the methodology to save the baselines for multiple projects at one time – without duplicating data or creating a potential mess by saving the master project. 15. At this point, it appears that all is well. In fact, upon opening Project B2, one of the two projects that we just set a baseline for, we can see the baseline was set. 16. However, this is where the interesting bit appears – if you go to the Set Baseline pop up box you there is no Baseline set/saved in the box. This does make some logical sense in one way. We never technically set a Baseline in this project directly. However, we did set a Baseline for this project and we have the data in the Baseline fields in the project. Every else, in Power BI, in Project Web App, in Excel Reporting, and in SQL this data does appear – it just appears without being set. In fact, because we closed the Master Project (Project2) without every saving it, we literally no longer have any record of this being set ever. 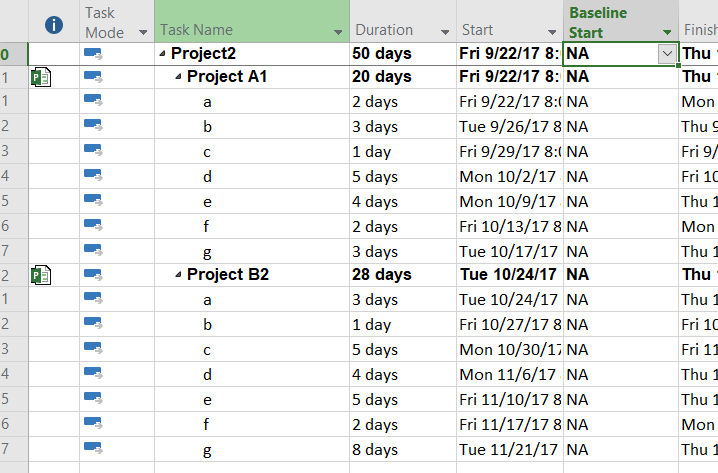 This might be a rare method of getting baselines into the project, but if the data is there, we would have expected the Baseline to have a set date. Maybe this will be something that is modified one day but in the meantime, just be aware that this is the case of the Baseline, No Baseline.